Caption slip reads: "Photographer: Emery. Date: 1952-03-29. Reporter: Emery. Assignment: National President United Spanish War Vets Auxiliary. 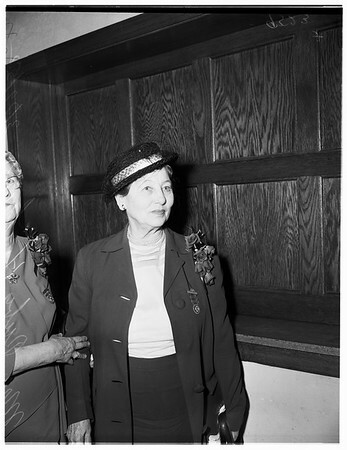 48, 49: Ruby H. Lyons (correct) of Hot Springs, Ark., National Pres. U.S.W.V. Aux - being greeted by members after Long Beach talk at Veterans Memorial Hall today".